Figure 8.4. 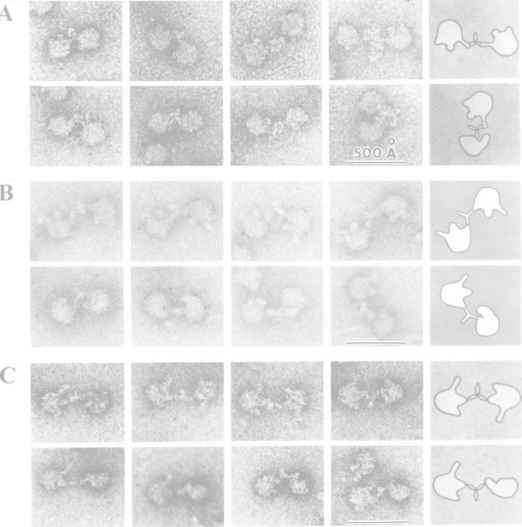 Electron micrographs of 50S ribosomal subunits reacted with antibodies. A: Antibodies against protein L7/L12. (W.A.Strycharz, M. Nomura & J.A. Lake, J. Mol. Biol. 126, 123-140, 1978. Original photo was kindly provided by J.A. Lake). The analysis of the surface of the E. coli ribosomes with the hot trituim bombardment technique (Yusupov & Spirin, 1988) demonstrates that ribosomal proteins can be divided into three groups: well exposed, fairly exposed, and buried or weekly exposed proteins. 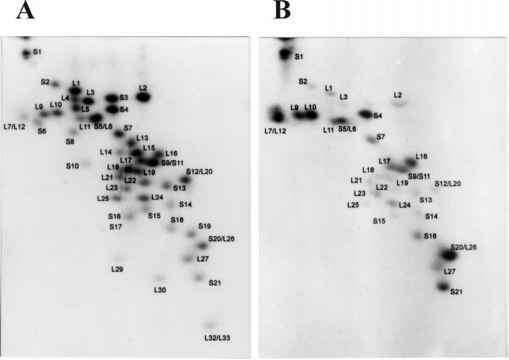 The best exposed proteins are S1, S4, S5, S7, S18, S20 and S21 on the 30S subunit, and L7/L12, L9, L10, L11, L16, L17, L24, and L27 on the 50S subunit (Fig. 8.6). The buried proteins are S8, S10, S12, S16, and S17 in the 30S subunit of the 70S ribosome, and L14, L20, L29, L30, L31, L32, L33, and L34 in the 50S subunit. It is interesting that the association of the two ribosomal subunits into the 70S ribosome does not lead to shielding any exposed proteins, this strongly suggesting that the subunits associate only by their RNA surfaces. The topography of ribosomal proteins of the 30S subunit with the exposure data taken into account is schematically given in Fig. 8.7. S4-S5-S20-S12-S16 at the central part ("body"), S18-S21-S6-S11-S15-S8 - on the side bulge, and S7-S9-S13-S19 and S3-S14-S10 on the head. Data regarding protein topography and protein binding sites on the primary and secondary structure of ribosomal RNA allow the approximate topography of the protein-binding regions of rRNA on the ribosomal particle to be deduced. First of all, this information helped to assign the rRNA domains to certain morphological parts of ribosomal subunits. Discussing general aspects of topography of the 16S RNA main domains and their correspondence to the main morphological lobes of the 30S ribosomal subunit, i.e. the body, side bulge, and head, one can use available data about mapping proteins on rRNA and on the 30S subunit. These data are as follows. (1) Proteins S4, S16, S17, and S20 are bound to the 5'-terminal domain, and at the same time are revealed on the body of the 30S subunit. (2) Proteins S8, 515, S6, and S18 interact with the middle domain of 16S RNA, and on the morphological image of the 30S subunit they are located either directly on the side bulge (platform) or on the line of contact between the side bulge and the body. (3) A group of proteins including S7, S9, S10, S13, S14, and S19 is attached to 16S RNA in the region of its 3'-proximal major domain, and all these proteins are found in the head of the 30S subunit (see Figs. 7.6 A and 8.5). 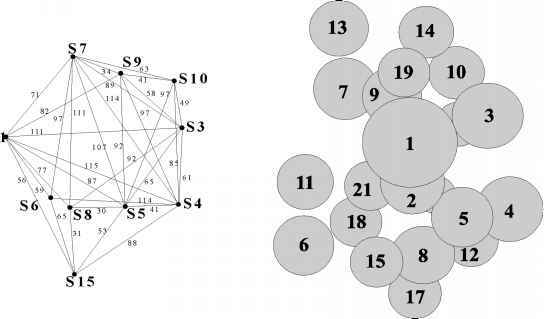 It can be deduced from this evidence that the three main structural domains of 16S RNA generally correspond to the three main morphologically visible lobes of the 30S ribosomal subunit. Thus, the 5'-terminal domain (I) forms the core of the subunit body, the middle domain (II) contributes to the formation of the side bulge or platform, and the 3'-proximal domain (III) fills the head of the subunit. The extreme 3'-terminal region (minor domain) of 16S RNA seems to protrude from the head base, or "neck," to the tip of the side bulge or platform, as evidenced by the immuno-electron microscopy data on the mapping of the 3'-end and 3'-terminal hairpin (see the next section). 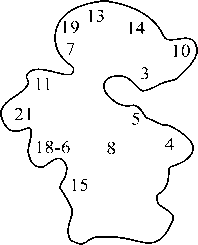 Figure 8.5. Contour of the 30S ribosomal subunit (according to M. Van Heel & M. Stoffler-Meilicke, EMBO J. 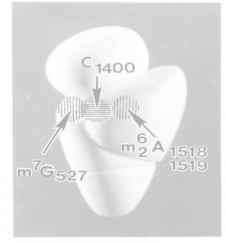 4, 2389-2395, 1985) with positions of some proteins localized by immuno-electron microscopy (M. Stoffler-Meilicke & G. Stoffler, in "The Ribosome: Structure, Function and Evolution", W.E. Hill, A. Dahlberg, R.A. Garrett, P.B. Moore, D. Schlessinger & J. Warner, eds., p.p.123-133, ASM Press, Washington, DC, 1990). Cross-linkable proteins are lateral part of the subunit below the protein L1 site; domain II is located at the base of L7/L12 stalk; and domains IV and V reside at the base of the central protuberance (see the morphological model of the 50S subunit in Fig. 5.8 C and the domain structure of the 23S rRNA in Fig. 6.5). Taking into account the universal character of ribosome three-dimensional structure one can suggest that all these conclusions are equally applicable to ribosomes from other sources. More detailed assignments can be also made in some cases. For example, since protein S7 is known to bind to the region comprising the sequences 935-950, 1235-1255 and 1285-1380, the corresponding cluster of five helices (internal helices 938-943/1340-1345 and 945-955/1225-1236, and hairpins 12411296, 1303-1334 and 1350-1372 in Fig. 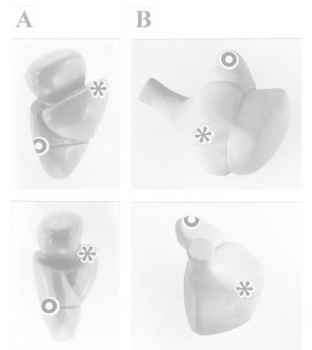 6.1) should be positioned in the head of the 30S subunit, near the "neck", on the side of the subunit bulge (see Figs. 5.5 and 8.5). According to the position of protein S8 that is bound to hairpin 588-651 (see Fig. 6.1), this helix is located on the border between the bulge and the body, near to the central part of the 30S subunit (Fig. 8.5). At the same time, the end of hairpin 673-717 on the same central rRNA domain (see Fig. 6.1) known to bind protein S11 should be placed at the upper part of the side bulge of the subunit (Fig. 8.5). A characteristic multi-hairpin node 400-550 (see Fig. 6.1) that is involved in protein S4 binding has to be positioned on the extremity of the opposite side of the 30S subunit (Fig. 8.5). Figure 8.6. Two-dimensional electrophoresis map of the ribosomal proteins exposed on the surface of the E. coli ribosome, as compared with the full set of the ribosomal proteins. (D.E. Agafonov, V.A. Kolb & A.S.Spirin, Proc. Natl. Acad. Sci. USA 94, 12892-12897, 1997). A: Full set of the 70S ribosome proteins separated by two-dimensional gel electrophoresis: Coomassie-stained gel. B: The proteins exposed to the tritium bombardment of the 70S ribosome surface: fuorogram of the 3H labeled proteins on the same gel. Figure 8.7. Modified model of the three-dimensional arrangement of the 30S ribosomal subunit proteins by P.B. Moore et al. (see Fig. 8.3 B) demonstrating the proteins well exposed on the surface (black spheres), moderately exposed (dark shaded spheres) and non-exposed (light shaded spheres), as determined by hot tritium bombardment technique (see the text and Fig. 8.6). The model is fitted into the electron microscopic contour of the subunit (see Fig. 8.5). (A.S. Spirin, D.E. Agafonov, V.A. Kolb & A. Kommer, Biochemistry (Moscow) 61, 1366-1368, 1996). Figure 8.8. 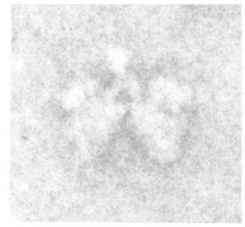 Electron micrograph of a pair of the 30S ribosomal subunits with an antibody molecule connecting the hapten-modified 3'-ends of their 16S RNAs. (I.N. Shatsky, L.V. Mochalova, M.S. Kojouharova, A.A. Bogdanov & V.D. Vasiliev, J. Mol. Biol. 133, 501-515, 1979. The original photo is provided by V. D. Vasiliev). First of all, this approach provided the successful localization of rRNA termini that are easily labeled selectively by hapten groups. The positions of the 3'- and 5'-terminal nucleotides of E. coli 16S rRNA on the 30S subunit, the 3'-terminal nucleotide of E. coli 5S rRNA and the 3'-terminal nucleotide of 23 S rRNA on the 50S subunit have been determined (Fig. 8.9). 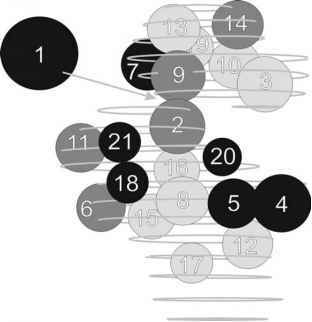 As seen, the 3'-end of the 16S RNA on the E. coli 30S ribosomal subunit is mapped in the region of the tip of the side bulge (platform), or somewhere between the bulge and the head. The 5'-end of the 16S RNA is localized on the body of the 30S subunit on the side opposite the side bulge. The 23S RNA 3'-end on the surface of the E. coli 50S subunit is mapped in the region of the L7/L12 stalk base, on the external side (the side turned away from the 30S subunit). The 3'-end of the 5S RNA is detected on the head or central protuberance of the 50 S subunit; this defines the localization of the entire 5S RNA-protein complex including proteins L5, L18, and L25. In addition, the position of nucleotide U40 of the 5S rRNA has been located on the central protuberance (head) of the 50S subunit (Evstafieva et al., 1985). In the case of the U40 residue of the 5S rRNA, the hapten was attached to the 3'-end of the 5S rRNA fragment U1-U40, the modified fragment was associated with the 5S rRNA fragment G41-U120 to form the modified 5S rRNA molecule that was subsequently incorporated into the 50S subunit. With antibodies against naturally modified rRNA bases, the locations of two neighboring N6, N6-dimethyladenosines (positions 1518 and 1519), N7-methylguanosine (position 527) and the cyclobutane dimer of 5'-anticodone base of tRNA with C1400 of 16S rRNA (that formed under UV-irradiation of the 30S subunit complex with tRNA1Val at P site) in the E. coli 30S subunit have been determined (Fig. 8.10). They all are found to be localized in the groove separating the head and the body, i.e., in the "neck", of the 30S subunit, m62A1518-1519 being at the bulge side (near the 3'-terminal A1542), and m7G527 and C1400 on the opposite side of the subunit. All the positions mentioned are known to belong to functionally important regions of the 16S rRNA. Figure 8.10. Location of some modified nucleosides of 16S rRNA on the surface of the 30S subunit as determined by immune electron microscopy. (m62A1518-1519: S. M. Politz & D. G. Glitz, Proc. Natl. Acad. Sci. USA 74: 1468-1472, 1977. m7G527: M. R. Trempe, K. Ohgi & D. G. Glitz, J. Biol. Chem. 257: 98229829, 1982. C1400: P. Gornicki, K. Nurse, W. Hellmann, M. Boublik & J. Ofengand, J. Biol. Chem. 259: 10493-10498, 1984). Compiled on the basis of the 30S subunit model proposed by V. D. Vasiliev. (Courtesy of V. D. Vasiliev). Figure 8.9. 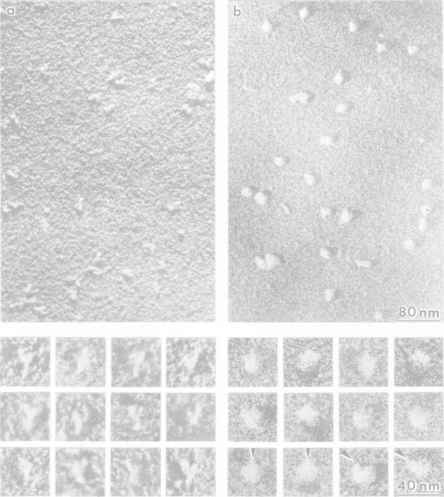 Photographs of ribosomal subunit models illustrating the localization of 3'- and 5'-ends of ribosomal RNAs. (3'-end of 16S RNA: I. N. Shatsky, L. V. Mochalova, M. S. Kojouharova, A. A. Bogdanov & V. D. Vasiliev, J. Mol. Biol. 133: 501-515, 1979; H. M. Olson & D. G. Glitz, Proc. Natl. Acad. Sci. USA 76: 3769-3773, 1979. 5'-end of 16S RNA: L. V. Mochalova, I. N. Shatsky, A. A. Bogdanov & V. D. Vasiliev, J. Mol. Biol. 159: 637-650, 1982. 3'-end of 23S RNA: I. N. Shatsky, A. G. Evstafieva, T. F. Bystrova, A. A. Bogdanov & V. D. Vasiliev, FEBS Lett. 122: 252-255, 1980. 3'-end of 5S RNA: I. N. Shatsky, A. G. Evstafieva, T. F. Bystrova, A. A. Bogdanov & V. D. Vasiliev, FEBS Lett. 121: 97-100, 1980). A: Two projections of the 30S ribosomal subunit model with marked 3'-end (asterisk) and 5'-end (circle) of the 16S RNA. B: Two projections of the 50S subunit model with marked 3'-end of 5S RNA (circle) and 3'-end of 23S RNA (asterisk). (Courtesy of V. D. Vasiliev). Determination of the precise mutual arrangement of all the structural elements of each ribosomal subunit, including proteins and their groups, the compact domains of rRNA, individual rRNA helices, etc., depends on the progress in crystallographic studies of the particles. It is encouraging that the ribosomes and their isolated subunits can be crystallized and the crystals diffract well. Now the crystallographic studies of bacterial ribosomal particles are being done in several groups. Meantime, several preliminary models of the quaternary structure of ribosomal particles, and specifically the small (30S) subunit, have been proposed on the basis of numerous indirect data, such as protein and rRNA topography, chemical cross-linking, foot-printing, neutron scattering, stereochemical analyses, etc., fitted to electron microscopy models (see, e.g., Spirin et al., 1979; Schueler & Brimacombe, 1988; Mueller & Brimacombe, 1997). The most recent 30S subunit model is based on the three-dimensional folding pattern of the 16S rRNA in situ, as deduced mainly from fitting individual elements of the well-known secondary structure of the rRNA to the fine structural elements of the 20 A cryo-electron microscopy contours (see Fig. 6.11); the model is the combination of the proposed 16S rRNA folding with the protein map and the protein-RNA cross-linking and foot-printing data.